The sun is a big battery of power. We have to learn to harness this energy and power. Of course, solar energy is the smartest energy choice under the sun! Now is surely the time to use solar energy to power up homes, helping in reducing our carbon footprint, while also reducing the electricity bills. Building efficient, sustainable homes is the order of the day. With an idea to make homes more energy efficient and having a green approach to electricity, many people are now installing solar panel kits in their homes. It is a fact that this has paid off, giving maximum efficiency. Here is a small guide to home solar power systems, solar panel kits and a review of the best three solar panels kits. Solar panels in simple terms are panels or devices that convert the solar energy into electricity, with the help of photovoltaic (PV) cells. These panels convert the abundant free energy present in the sun, relying on the photoelectric effect. The panels or cells are connected and form a framework of solar panels. Whether you are DIY enthusiast looking for some do-it-yourself solar panel kits, or someone on the lookout for some best home solar kit, there are many types of solar panel kits available in the market today. You can also install an off-grid solar power system, which is very suitable for people who crave for energy independence and who live in remote homes. Typically, the monocrystalline solar panels and systems are more efficient than other types of solar panels. These monocrystalline solar panels are made of silicone and are solid black. Though expensive, these solar panels pay off in the long run. Listed below are three of the best products in solar panel kits, ideal for a starter kit and for off-grid applications such as boats, RVs, cabins, sheds, trailers etc. Easy to use, cool to look at, and sophisticated to use with your RVs, boats, and other outdoor equipements. Comes with PWM 30A charge controller and our unique designed Z brackets so you can charge your battery at ease and mount your panel stable. You also get a pair of 20 feet MC4 adaptor kit to connect your panels to charge controller just in seconds. With Renogy 30A PWM Charge Controller, you can add up to three 100W solar panels to this system based on your available space. Added tray cable for connection between charge controller and battery. The Renogy 100 Watts 12 Volts Monocrystalline Solar Starter Kit is a superior solar panel kit and comes as a top choice pick. This gives great power output and is a highly recommended solar panel by the industry experts. It is a monocrystalline solar panel, which comprises of high purity silicon. Installing these is an excellent way to start the greener approach to power and have sustainable energy. This starter kit is ideal for off grid applications like trailers, RV’s boats, sheds and also cabins, providing power and giving an independence from the grid. The solar panels manufactured here at Renogy are durable and are created to withstand even heavy winds and snow at the same time producing electricity in low light settings. 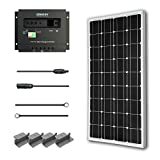 One of the outstanding advantages of this solar panel kit is that the wattage enables this kit to recharge RVs, boats, and other large items. This panel comes with an excellent warranty for power output, which is 25 years. A 5-year material and workmanship warranty are also present. Though the monocrystalline cells increase the cost, the final output is quite satisfactory and worth the investment. The Renogy 200 Watt 12 Volt Monocrystalline Solar Starter Kit with Wanderer is suitable for several off-grid applications. This gives great independence and iseasy to install. It is easy to charge many small devices without any hassle. 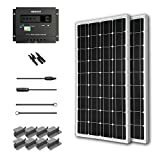 The Renogy 200 Watt 12 Volt Monocrystalline Solar Starter Kit with Wanderer is a solar panel that is designed with great solar cell effectiveness, carrying a high solar efficiency of 18.4%. The panels can last for many years due to the corrosion resistant aluminum frame. This starter kit is protected for overload, shortcircuits, reversed polarity and overcharging. Two Renogy 100W 12V Monocrystalline Solar Panels. A 30A PWM Wanderer Charge Controller. Considering many factors this solar panel kit delivers high performance and stands up to its name. Definitely worth considering it as it is one step towards sustainable energy. 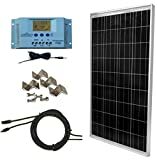 The kit includes: (1) 100 Watt WindyNation Solar Panel, 30-Amp (user adjustable) WindyNation P30L LCD Display Solar Charge Controller with Battery Temperature Sensor, 40 feet of UL Listed 12 AWG Solar Cable, all necessary MC4 Connectors, solar panel mounting hardware and Installation Manual. PWM Solar Charge Controller has user adjustable settings! LCD Screen shows system amperage, voltage, amp-hours, temperature and DC load draw. See Image in photo gallery for all LCD Screen readouts. This kit comes with everything that you need to get started which is a 100% complete Off-Grid Solar Kit. The WindyNation 100 Watt Solar Panel Off-Grid RV Boat Kit is an ideal solution for camping or remote cabins. It is quite popular for providing power for boats, RVs and even marine retrofitters. Combining two or more panels act as a backup during critical power outages. The WindyNation 100 Watt Solar Panel Off-Grid RV Boat Kit is a good quality kit that provides great value. Wrapping up, going the solar way is the way forward. With many options available in the market, reducing the carbon footprint is a great possibility. Choose the right solar panel kit according to your needs and specifications. Going solar, in small increments, pays off with the sleek and powerful Renogy 100 Watts 12 Volts Monocrystalline Solar Starter Kit. Once you are comfortable, it is always quite easy to upgrade to bigger systems. Copyright © 2016 POWER SPAR.COM | SOLAR PANEL REVIEWS | COMPARE SOLAR PANELS | BEST SOLAR PANELS. All Rights Reserved.